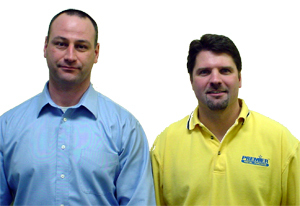 With 28 years of RTO experience between them, Dave Bauer and Shawn Newman have gone into business together, opening their first Premier Rental-Purchase store in Harrisburg, Pa. It's been a goal for each of them for several years, and they've done their homework to find the best vehicle for success. For a variety of reasons they opted to become a Premier franchise, and they are confident that combining their experience with the depth of franchising support that Premier offers will enable them to accomplish their personal and professional goals. Customer service, good rapport with customers and a good relationship with staff is how Dave has achieved his success within the industry. Working his way up from account manager to store manager to regional manager for one of the larger competitors, he experienced the internal dilemmas of a large corporate structure. For half a decade he considered the benefits of opening an RTO business of his own. He researched franchise opportunities both in and out of the RTO world and felt that franchising was definitely the right decision for him with Premier Rental-Purchase. "I got out there and researched the possibilities. Being in the business myself, I saw the reputation Premier dealers were gaining. I could recognize them. So I took a look at what Premier had, and they offer the best opportunity to a franchisee. What stood out about Premier was that their fees were lower than others. They have an outstanding financial package. They offer quick-response support when a dealer has questions. Their knowledge of doing this over and over again has been very helpful." Shawn's background in RTO management, especially multi-unit management for the same firm Dave worked for, has given him a love for the industry and a long list of accomplishments in it. "I do whatever it takes to satisfy any customer. Do what it takes to make the store successful," he said. And what he likes about it is the freedom to make decisions and interact with customers. "The fact that we develop relationships with customers resonates with me." He is sure that owning his own business will only enhance his feelings and effectiveness in the industry. Like Dave, he has seen many of his peers launch their own businesses and enjoy them. Committed to RTO as his focus, he gravitated to the Premier Rental-Purchase business model and their proven success in helping RTO dealers get their start. "You couple that with their latitude that would enable me to truly run my own business, and it was a logical choice for me." Shawn adds, "Premier, bar none, trumps the other franchises with what they offer and deliver. That includes the flexibility factor. No one in the organization is pigeonholed. There is not a set procedure. They see we are experienced, and they believe in giving us operational independence. I can certainly say their philosophy is for dealers to take and run with their dream. And that's what we're going to do." Another piece of logic in the quest that Dave and Shawn shared to become independent was that they join forces and open a business together. Both were heading in the same direction and committed to hard work and discipline - what they felt were the basics for success. They both want to do things differently from what they've had to do within corporate constraints. Trooper Earle, president/CEO for The Premier Companies has enjoyed watching their progress as members of the Premier family. "Seeing these two experienced RTO dealers come together to open their business is looking success square in the face," he says. "They both recognize what it takes to kick this off and make it a winning situation for themselves, and they'll serve as inspiring examples of the quality of dealers Premier attracts. It's great to have them on board. It will be exciting to watch them soar." The national office of Premier Rental Purchase is located in Williamsburg, VA. All Premier stores are independently owned and operated. Visit Premier's website at www.premierrents.net or call (800) 2Premier and ask for Trooper Earle.